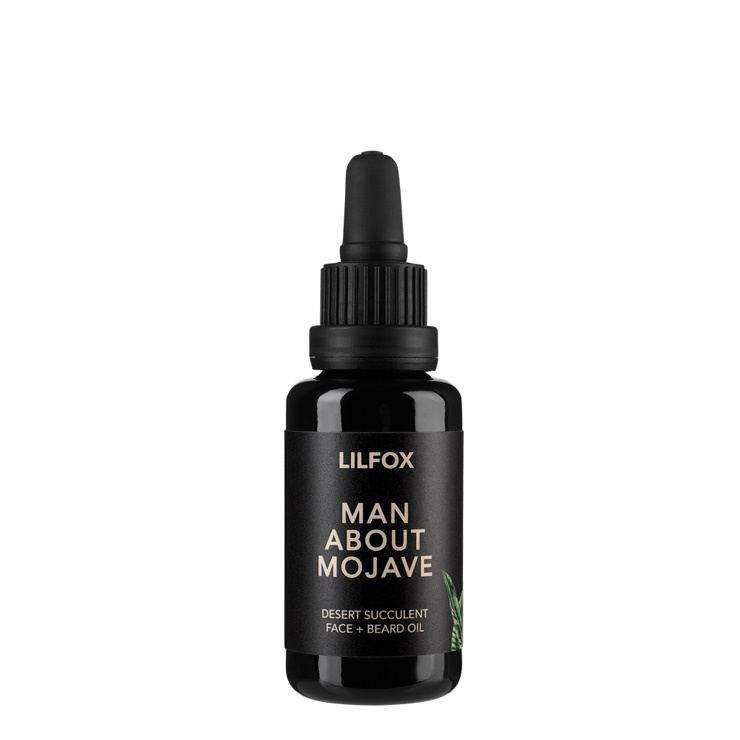 An anything-but-boring Dopp kit staple, Man About Mojave face and beard oil goes way beyond simply taming facial hair, though that’s important too. This oil cocktail combines prickly pear, red raspberry, and black cumin to offer the biggest bang for your buck in making skin look and feel healthy, smooth, and fit. Sand verbena and agave give skin a protective feel to keep it looking its best in any environment. Use to hide the appearance of skin imperfections and soften lines and wrinkles. This multitasker makes skin and whiskers feel super soft and moisturized with an herbal patchouli aroma. 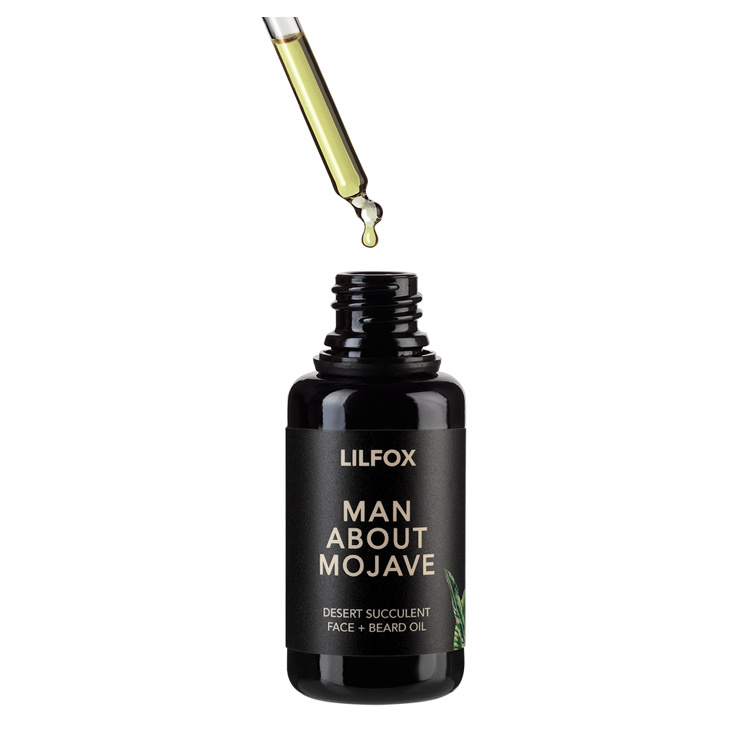 Warm 2-3 drops of oil between palms and massage onto skin and facial hair for a feeling of max hydration and manageability. Use both day and night, or whenever in the mood for a hit of earthy scent. O.Fica Indica (Prickly Pear) Oil*, S.Chinensis (Jojoba) Seed Wax*, V.Vinifera (Grapeseed) Oil*, A.Spinosa (Argan) Oil*, C.Sativa (Hemp Seed) Oil*, E.Palmitate + O.Biennis (Evening Primrose) Root Extract + A.Villosa Leaf (Sand Verbena) Extract + A.Americana (Agave) Stem Extract + T.Brevifolia (Joshua Tree) Root Extract + O. Cocconellifera (Cholla Cactus) Flower Extract + F. Splendens (Ocotillo) Stem Extract + L.Tridentata (Creosote Bush) Extract, Helianthus Annuus (Sunflower) Seed Oil + O.Tuna (Prickly Pear Fruit) Extract, R.Idaeus (Red Rasberry Seed) Co2*, C.Sinenis (Camellia) Oil*, N.Sativa (Black Cumin ) Oil*, P.Cablin (Patchouli) Oil*, V. Zizanoides (Vetiver) Oil* , P.Graveolens Var. Roseum (Rose Geranium) , C. Reticulata (Green Mandarin) Oil, Officinalis (Rosemary) Extract + B.Campestris (Rapeseed) Oil, B.Carterii (Frankincense) Co2 Extract**.